Maj. Gen. Christopher Hughes presents ROTC Medallion to Maj. Gen. (R) Wallace Arnold (Class of 1960). 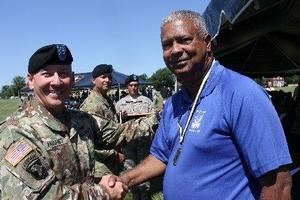 (From left) Maj. Gen. Hughes presents medallion to LTC (R) Claude Vann, III (Class of 1977). Hampton University is proud to announce that two former officers at the “Mighty Pirate Battalion” have been selected as national Hall of Fame Inductees. 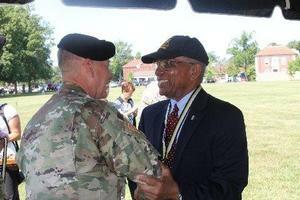 HU alumni Maj. Gen. (R) Wallace Arnold (Class of 1960) and Lt. Col. (R) Claude Vann, III (Class of 1977) were inducted into the 2016 inaugural class of the U.S. Army ROTC National Hall of Fame at 10 a.m. on Friday, June 10, 2016 at Fort Knox, Kentucky. These leaders have exemplified the “Standard of Excellence” since their commissioning, and they continue to contribute to the legacy. The Hall of Fame induction is awarded to alumni whose character and distinguished service epitomizes quality leadership. Additionally, these officers were recognized for their continued development of future officers. A permanent record of their service and accomplishments were added to a prestigious assembly of Hall of Fame inductees, each an enduring model and source of inspiration for Army ROTC Cadets. This year’s induction ceremony coincided with Army ROTC’s Centennial Commemoration Ceremony, where they celebrated their 100th year anniversary. During the commemoration ceremony, several officers from across the nation were inducted. Since the program at HU’s inception, HU has commissioned over 1500 officers in the United States Army. For more information about HU’s Hall of Fame inductees or the inaugural ceremony, call 2nd Lieutenant Brett Harris, Gold Bar Recruiter. Call (757) 728-5244 or email at hamptonS5ROTC@gmail.com.